AACS processing key hacked again! After the initial AACS processing key was found and publicized, consumers who owned HD DVD’s or Blu-ray Discs found that they could easily back up their high definition movies with the help of various freeware utilities. A round of legal threats was then sent out to various websites who had published the processing key and a rebellion was stirred up on online communities around the web. AACS LA, the authority behind the Advanced Access Control System (AACS) protection, attempted to remove the key from the public view. Their efforts to suppress the processing key were futile, as the cat was already out of the bag. Some people even purchased AACS processing key t-shirts, which helped to propagate the knowledge of the key even further as well as provide a fashionable piece of clothing for some technology enthusiasts. AACS revokes keys and new processing key is hacked again! AACS LA has since “revoked” the initial, compromised processing key. This means that none of the AACS protected movie titles released after the initial revocation can be decrypted using the old processing key. Shortly after this revocation occurred and new AACS movie titles had hit the market, the makers of AnyDVD HD announced that they had successfully “hacked” the new form of AACS, meaning that they had discovered a new processing key. AnyDVD HD is a closed-source commercial product, so they did not release the new key for public consumption. 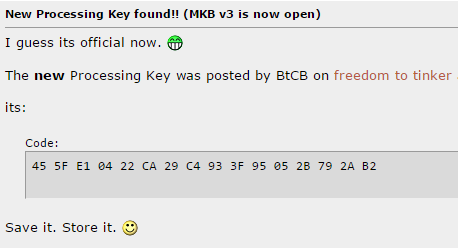 On May 23rd, someone going by the name “BtCB” posted a new AACS processing key on Freedom-To-Tinker.com. The new key was noticed, republished on Doom9.org and confirmed by multiple users that it was able to decrypt new AACS protected titles. Below is a screencap of the Doom9 forum post. More AACS processing key hacking, what happens next? According to the discussion at Doom9, AACS has not yet played all of their cards. The current processing key can always be revoked and then reissued again, numerous times. The major problem the AACS LA has is that they must give software and hardware manufacturers 90 days notice before revoking old keys and implementing new keys. This gives AACS “hackers” a nice window to crack new processing keys or find new ways to circumvent the AACS protection. The cat and mouse game will continue on the HD DVD side of things, since the only form of protection for HD DVD discs is AACS. At the other end of the high def formats, Blu-ray Discs have multiple forms of protection available to utilize, including AACS, ROM-Mark and BD+. Blu-ray movies protected with BD+ are expected to be released this year. It will be interesting to see whether or not the online communities will be able to circumvent or work around BD+ protections.